Practice Practical Exam | Microanatomy Web Atlas | Gwen V. Childs, Ph.D. The answers are in the “image information” for accessibility. This guide is designed to help you with the topic as you study it throughout the entire first two years. 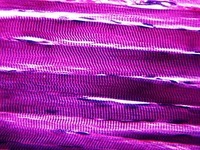 1) How would you distinguish smooth, skeletal and cardiac muscle? 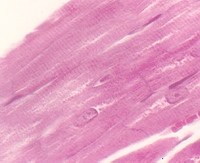 2) How would you distinguish the three types of muscle layers (epimysium, perimysium, and endomysium)? 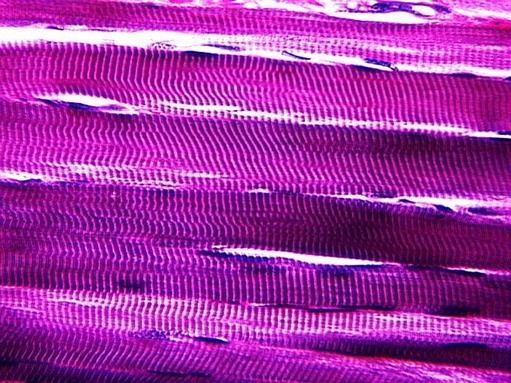 3) How do myoblasts develop into skeletal muscle fibers? What is the role of satellite cells? 4) How do smooth muscle cells contribute to atherosclerosis? 5) Why do body builders work on certain muscle groups on a given day and then give them a rest period? What is happening when they increase muscle mass? 6) What is the basis for the hereditary disease --Duchenne muscular distrophy? What is lacking and why is it important? 7) How can subtypes of fibers be distinguished? What is myoglobin and how is it distributed in these subtypes? 8) How do actin and myosin filaments interact in a sarcomere? Define the role of troponin and tropomyosin? 9) How does the sarcolemma communicate with the inside of the muscle to facilitate contraction? Trace the signal from the nerve fiber to the sarcolemma. Then, trace the signal into the myofibrils. What carries it? What is the role of the sarcoplasmic reticulum? 10) What structures sense position, length and tension in our muscles and tendons?